We envision a school that provides challenging opportunities in a culture where an authentic enthusiasm for learning exists. One where all strive to be responsible, motivated citizens of strong character. One that contributes to the development of our community and promotes a passionate commitment to Irish Pride. The mission of Waldport High/Middle School is to prepare students to be productive citizens by developing a strong work ethic and the higher-level critical and creative thinking skills that prepare students for college and 21st century careers. A safe, supportive, and respectful learning environment. Positive student, staff, family and community relationships. Collaboration and team building. Participation in athletics and extracurricular activities. Appreciation for creativity and the arts. Workplace experience through business internships and job shadowing. The curiosity, adaptability, and initiative to be influential in a technological society. Empowering students to learn at their own pace and through the lens of their own interests. Personalized support systems to help every student succeed. Failure is not an option. Today, Waldport is a city in Lincoln County and the high school, established in 1903, serves a community population of approximately 2,050 from Yachats to South Beach. The WHS student population is approximately 185 students in grades 9-12. We are the Fightin’ Irish with kelly green, white and black as our school colors. 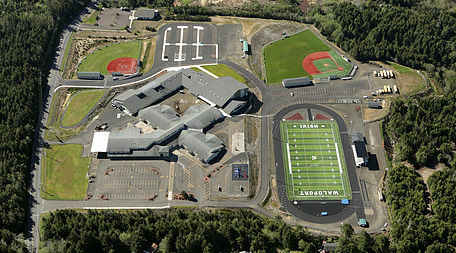 Waldport High School is known for its individualized attention to students, with an emphasis on science, technology and the arts.